According to the flash estimate, the 3Q17 GDP grew by 4.7%year-on-year above consensus at 4.5%YoY and close to our forecast at 4.6%YoY. GDP bottomed in 2H16 at 2.6 -2.7%YoY and since then is accelerating with the Q/Q rates above 1%, in 3Q17 it grew 1.1%Q/Q. We don’t know the backdrop of the GDP structure, but we can assume the main driver is consumption driven by the sound labour market and fiscal stimulus (child benefit). The new element is the investment, which recovered and grew in 3Q17 close to 5%YoY according to ING estimates vs 0.8%YoY in 2Q17. The EU money inflows recovered from the record low in mid-16. 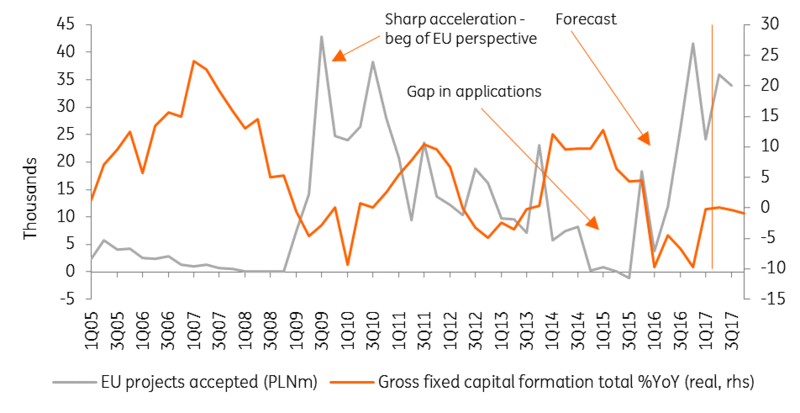 The low base in investments as well as the ongoing recovery in the EU co-financed project speed up investment growth. We estimate full-year GDP growth in 2017 at 4.2%YoY and close to 4% in 2018. 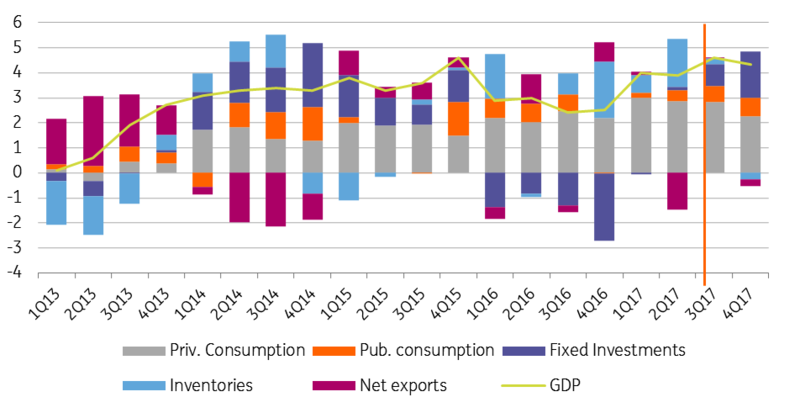 The sound GDP data is PLN positive, although its impact on PLN should be slightly diminished by the last National Bank of Poland projections which is showing that NBP subscribes to flat Philips curve conundrum, we have flagged the weak link between the labour market tension and inflation. NBP shows rising activity rate of employees in the age of 40-60 as well as the sustainable inflow of Ukrainian labour still containing too high wages dynamics. Also consistent with our view, the point that low Eurozone inflation and still subdued commodity prices should offset rising domestic inflation pressure coming from the local labour market. The NBP projection may temporarily contain some hawkish voices in MPC. But we think NBP and governor Glapinski seems to be overconfident with his rate guidance assuming flat rates until the end of 2018. NBP said yesterday that companies would rather constrain production than raise prices in reaction to higher wages. We think ongoing investment acceleration (first public already materialising, then private we hope) should cause non-linear acceleration of wages. The process already started in the construction sector. This as well as strong wages claims in other sectors, facilitated by the government policy, may force more MPC members to join hawks camp, thus we see MPC hike in 4Q18 with risk skewed to the earlier hike.